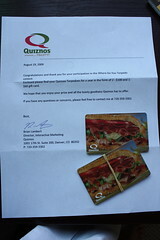 For my travel, hard work and top ten finish in the Quizno’s contest, I was rewarded with $260 in gift certificates which nearly covers the cost of one of the flights I paid for to film the actual entry. C’est la vie. The bad news is I just saw “Food Inc.” so I don’t really feel comfortable eating at Quizno’s, and when it comes to fast food I’m going to try to stick to the more ethically responsible folks at Chipotle. Also, I like burritos. The good news is, the gift certificates came in 3 parts, so when I hold a contest of my own I will be able to reward 3 people for something, whenever I decide what that something is. Perhaps it will be a photo competition. And I’m just putting this out there right now – if anyone happens upon a duck wearing a jean jacket (of is able to ETHICALLY force a jean jacket on a duck) you will automatically win one of the $100 cards.